Mimicking the iridescent shimmer of the male Indian peafowl, peacock tanzanite transitions between bright greens and royal blues. What Color is Peacock Tanzanite? Traditional tanzanite is a gemstone known for its intoxicating blue, violet, and burgundy tones. Peacock tanzanite represents a variation on this lovely gem, featuring a fascinating transition between cheerful green and bright blue hues. These colored gemstones should appear eye-clean, and any inclusions should not be detectable with the naked eye. Once polished, peacock tanzanite possesses a brilliant, glass-like luster. Gemology circles describe this as a vitreous luster. As a translucent gemstone, faceting is common in peacock tanzanite. For the most part, tanzanite gems don’t reach larger sizes. Stones over several carats in size become increasingly rare. As a result, the demand for larger stones frequently sees the price rise alongside the carat weight. Cluster settings are a trendy option with peacock tanzanite, as the groupings of stones increase the captivating color transition effect. As a general rule, it’s common to find peacock tanzanite in modern faceted shapes, such as round, oval, and marquis. Not only are the shapes pleasing to the eye, but elongated shapes like the oval and marquis can also provide the appearance of a larger gemstone while retaining a nice color and beautiful clarity. Tanzanite is a suitably hard stone. Ranking between 6.5 to 7 on the Mohs scale of hardness, peacock tanzanite will resist most scratches and abrasions. 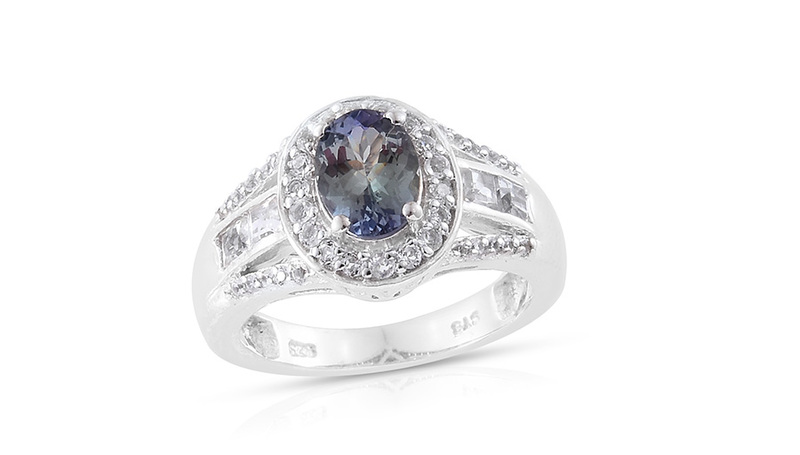 However, it can be susceptible to cleaving so exercise care when wearing tanzanite gemstones, especially in rings. While peacock tanzanite may undergo heating during stone production, this does not create color within peacock tanzanite. The colors occur naturally. 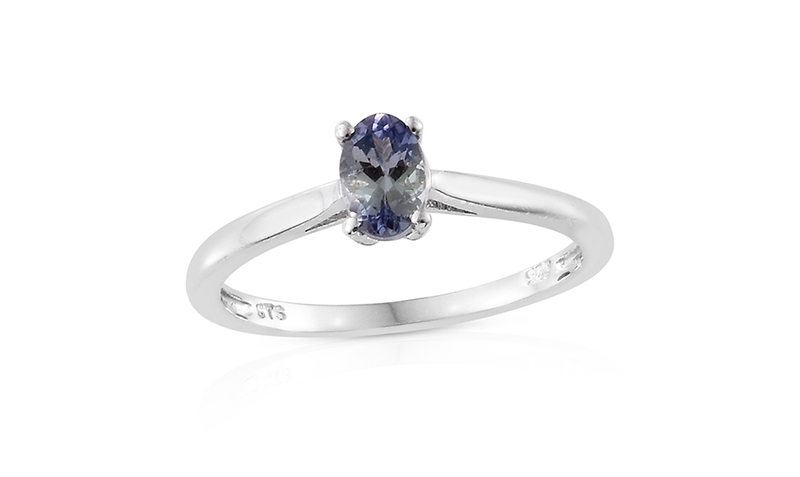 Heating tanzanite only produces the blue and violet colors for which the stone is known. Typically, stones are cut and polished before heating. Blemishes and cracks in the rough can worsen when subjecting it to heat, ruining the material. So, a cutter must consider how the finished stone will appear after heating when faceting it. Among tanzanite, the peacock tanzanite variety is scarce, and only about one-percent of production will possess this particular color variety. How did Peacock Tanzanite Get its Name? • Peacock tanzanite is named for its color. It’s similar in hue to the Indian peacock, an exotic bird with iridescent blue to green plumage. It's easy to see why this beautiful bird inspires this stone's name! • The word tanzanite, on the other hand, has a more interesting origin. Tanzanite is named for Tanzania, the country from which it is mined. It is a variety of blue zoisite. Popular gem lore suggests that when tanzanite was first being marketed, the name blue zoisite bore too much similarity to the phrase “blue suicide.” Eventually, this lead to the unique single-source gemstone being called tanzanite. Is Peacock Tanzanite a Birthstone? • Peacock tanzanite is one of three December birthstones, alongside turquoise and zircon. Tanzanite is a relative newcomer to the modern birthstone list, with the American Gem Trade Association adding tanzanite to the official list in 2002. This represents one of only a handful of times that the list has been amended since adoption in 1912. • Only discovered in the late 1960’s, peacock tanzanite doesn’t have any association with the tropical zodiac. Tanzanite is one of the rare single-source gemstones of the world. Peacock tanzanite occurs with its cousins in the Merelani Foothills of Tanzania. Since the late 1960’s, miners have been extracting this precious gemstone from the Earth. How is Peacock Tanzanite Mined? Miners employ both modern and traditional techniques when extracting peacock tanzanite. 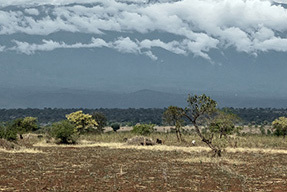 Modern mining techniques find use in the ‘C’ block the tanzanite mines. It’s here the government sponsored mining company performs the bulk of extraction. This provides a consistent and efficient way for the stone to be acquired. Much of the process is automated, with specialized machines doing the brunt of the work that was once performed by hand. Artisanal methods are still heavily used in the other blocks of the mine. Artisanal mining techniques include time-tested methods for digging up the earth in search of precious gems. These include the use of tools such as picks and shovels, and washing mined rough through panning methods that have existed for centuries. 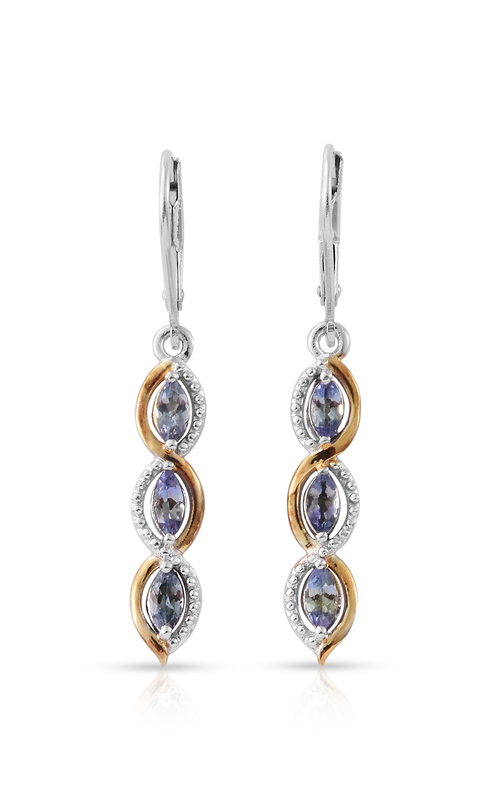 Shop LC is a primary Sightholder for tanzanite. This partnership with the mine ensures that a steady supply of high-quality material is always available to Shop LC. Mine sightholders enter a contract where they agree to purchase an amount of rough from the mine on a regular basis. By committing to this purchasing agreement, Shop LC offers tanzanite jewelry at a daily low cost that’s difficult to beat. Peacock tanzanite shifts between greenish to bluish hues, mimicking the iridescent sheen of Indian peacocks. Sourced from the Merelani Hills of Tanzania. Peacock tanzanite is heat treated to create and improve color.